I guess I'm on a slogan tee kick this week, haha! I love this one, which says, "Paris, I love you" in French. I've never been to France before, but much like the rest of the human population, i want to visit someday. Until then, I'll just admire the food and culture that's so influential here in the states and pretty much everywhere, right?! Last week, I shared 7 different ways to wear olive green this season and today's outfit is yet another example and inspiration, I hope! 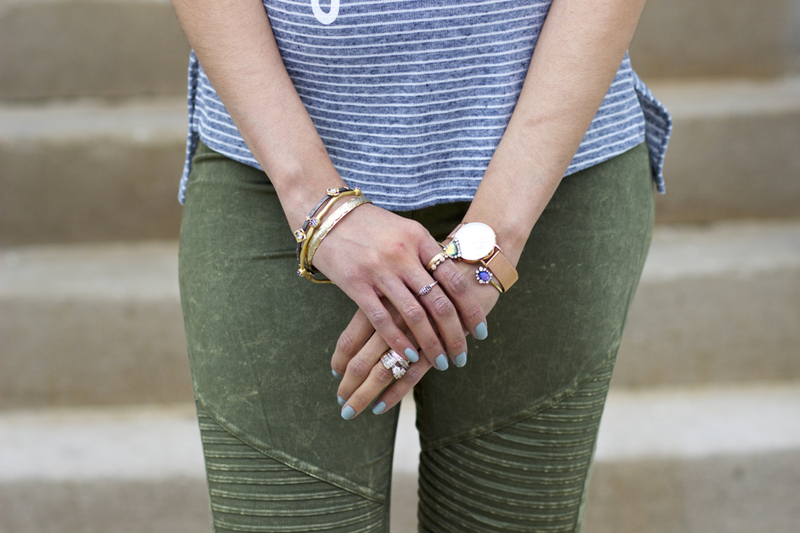 Would you believe that these are actually leggings, not jeans?! Yup and they're maternity leggings at that! Eddie couldn't believe it. When he first saw me wearing them, he said, "I love your jeans, honey." When I told him they were leggings, he swore they were jeans, until he looked closely and felt the fabric. Don't they look like jeans? They're from the brand Preggo Leggings, who were so kind enough to send me a pair of my choice, I chose these because you know how much I love olive and all things moto (we've established my obsession with leather moto jackets, lol). They don't feel like your typical cotton or spandex leggings, yet they don't feel like jeggings, they feel rather smooth and are quite comfy; I don't know how else to explain them, haha. I decided to pair them with the striped tee because I not only loved the color combination, but I also loved the effect of the stripes on the tee and the moto panels on the leggings, which have a stripe-like effect. When it comes to stripes and a baby bump, things can get a bit tricky, as you can imagine, they can make you appear quite large and wide, which no mom -to-be wants; we want to flatter and embrace the bump! When working with stripes on a smaller scale with a v-neckline, like this top, it helps to prevent any exaggerated effects, which is quite awesome. 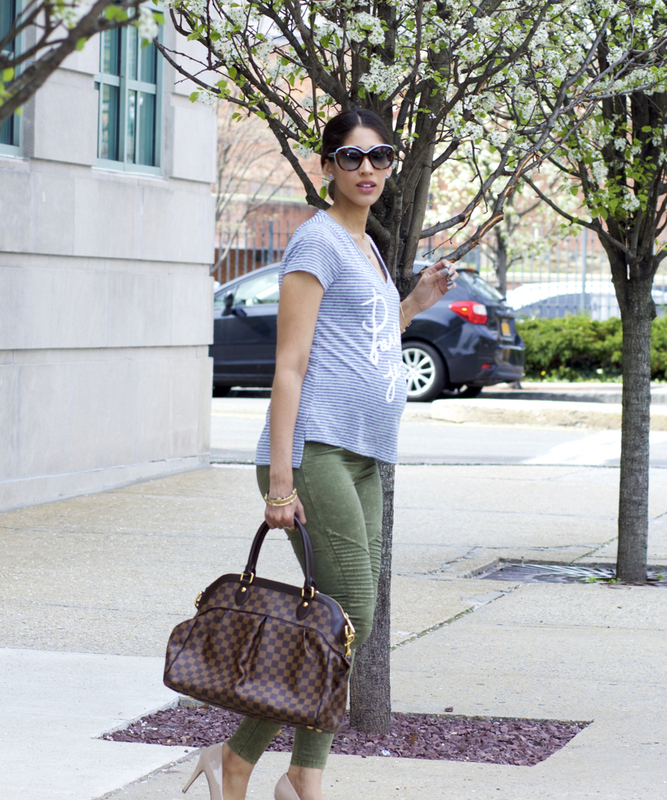 You don't have to say good-bye to stripes just because you're preggers, ladies! What are your plans this weekend?! We'll be heading to Brooklyn to celebrate my mom's birthday, which was last Tuesday. Due to the crumby weather and both Eddie and my step-daughter, Destiny, not feeling well, we postponed the festivities for this weekend and I'm so excited! I love my mama boo and can't wait to celebrate her (and bother her, I always bother her, haha). Be sure to follow along IG stories, I'll be sharing our weekend there! Thanks so much for stopping by, my dear friends, and I hope you have a wonderful weekend ahead!